I was walking around the Centro Historico of the city of Queretaro north of Mexico City today, looking for the old train station that a friend I met here recommended I visit when I stumbled upon a magical little plaza, just north of the river on Avenida Juarez. 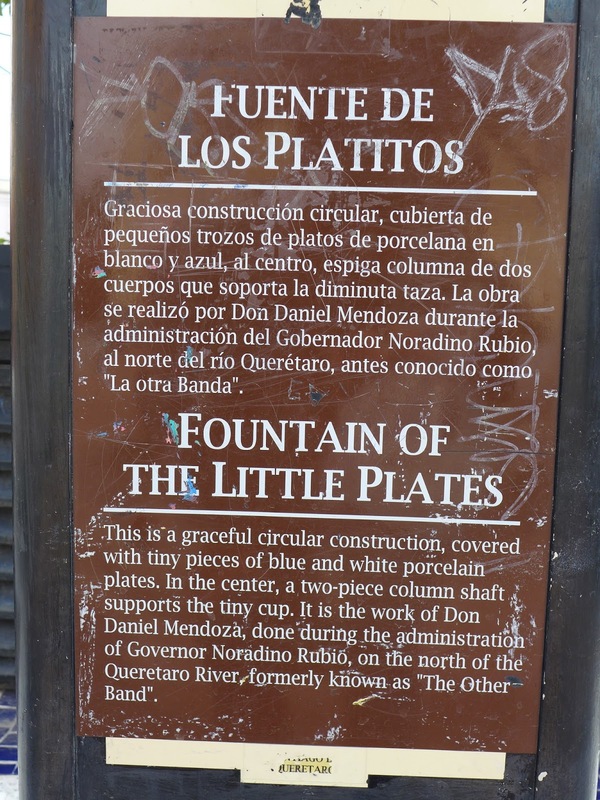 The only information on the plaza and its creator I could find was a small sign calling the plaza Fuente de los Platitos, which means Fountain of the Little Plates. The artist who built it was Don Daniel Mendoza. It was commissioned during the administration of governor Noradino Rubio, who was in office from 1939 to 1943. The style of mosaic is called Picassiette in French, named after the Maison Picassiette built by Raymonde Isidore in Chartes, France around the same time as the construction of this plaza. Picassiette literally means 'scavenger' in French. 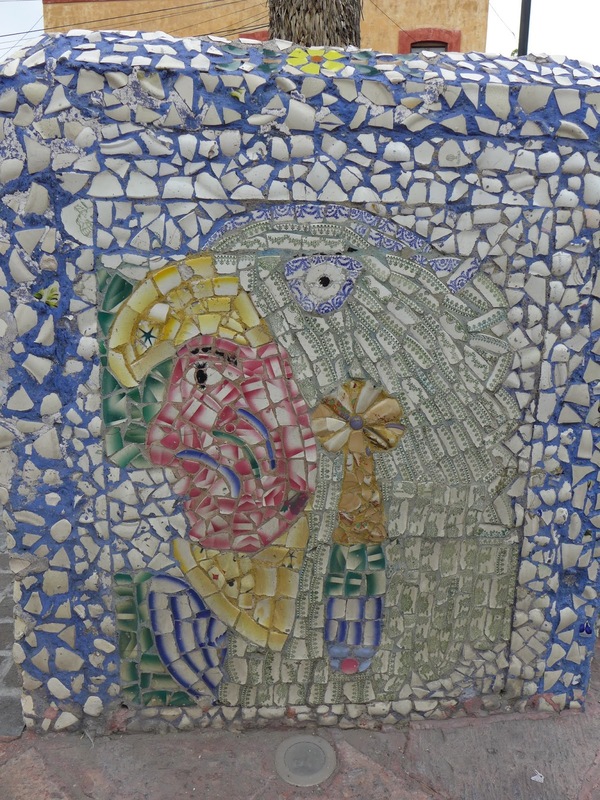 Isidore collected the material that he covered the interior and exterior of his house with mainly from garbage dumps. Assiette also means plate in French. 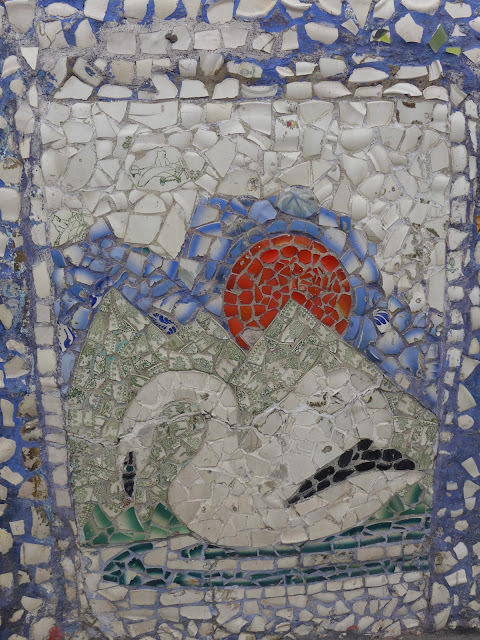 Having done a fair amount of tile mosaic work, I know for a fact that working with crockery and porceline has its difficulties because it is glazed on both sides, which makes it harder to adhere to the mortar thinset used to attach it to the surface you are covering. It also has curved surfaces, so in order to avoid sharp protruding edges you have to use small pieces to maintain a flat surface. One of the patterning techniques that Don Daniel Mendoza used was to create tightly fit areas on the flatter surfaces and then to leave larger gaps on the curves at the tops of the benches. He used blue colored grout to fill in the gaps that read as blue banded borders that ties the long undulating benches and walls together. 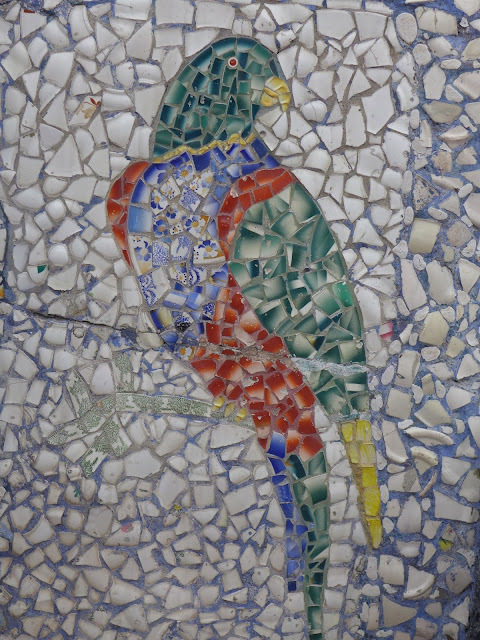 In the early 1940's the use of latex as an additive to tile setting mortar increased the strength and bonding properties making it easier to build durable mosaics. This park is now 75 years old and is in excellent condition. At the center of the plaza is a traditional round fountain which has the least amount of ornamentation. This leads me to believe it might have been the first part of the plaza project and that inspiration for greater ornament came later with the building of the walls and benches. The walls have oval perforations with a circle of black in between repeated around the perimeter of the plaza. 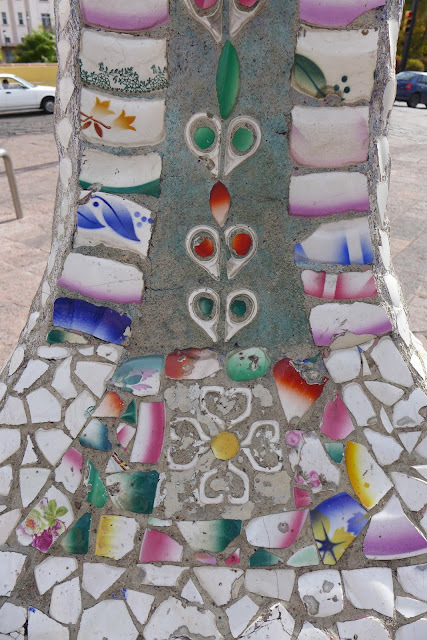 Each bench has a colorful garland under the seat and an oval medallion with an animal mosaic inside centered on the backrest, with farm animals and birds and insects often beautifully rendered using bits of colored plates. The use of color and patterning from the plates makes for wonderful portraits. Not sure what this is…a lamb? 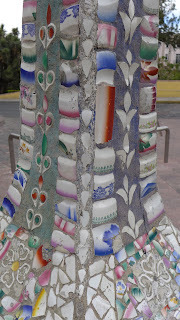 Many thousands of porceline plates and cups had to be collected to create the mosaics in the plaza. They were broken and cut to fit, separating colors to use in a large variety of designs. At the far end of the plaza there is an architectural panel with a coat of arms, crowned in a rising sun with eyes and a cross flanked by two stars over a man on horseback bearing a sword, and an arbor laden with grapes. These could represent the divine heavens, victory and prosperity. The foliar garland framing the coat of arms is particularly beautiful to me, as are the sinuous flowering plants on either side. 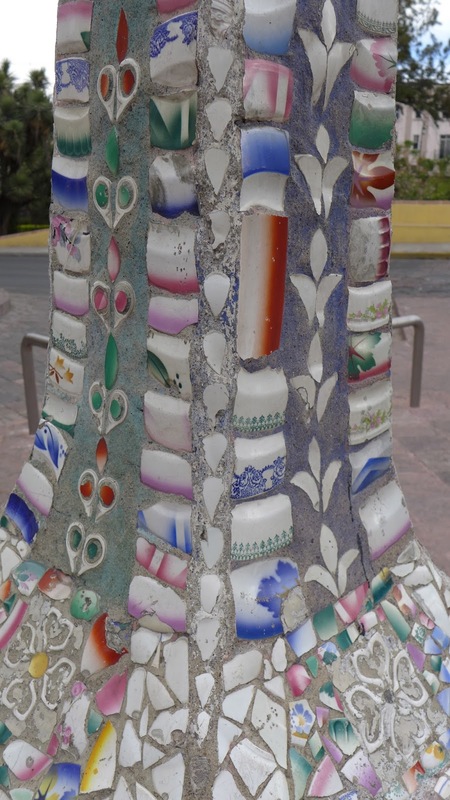 Centered on the plaza next to the fountain is a curved mosaic panel with an image of an eagle with a rattlesnake in its beak on a fruiting nopale cactus, which was a vision that lead to the founding of the Aztec capital at Tenoctitlan. It is the image depicted on the Mexican flag. Around this image are mosaics of mountains, snow capped volcanos, and one striped with the colors of he Mexican flag. 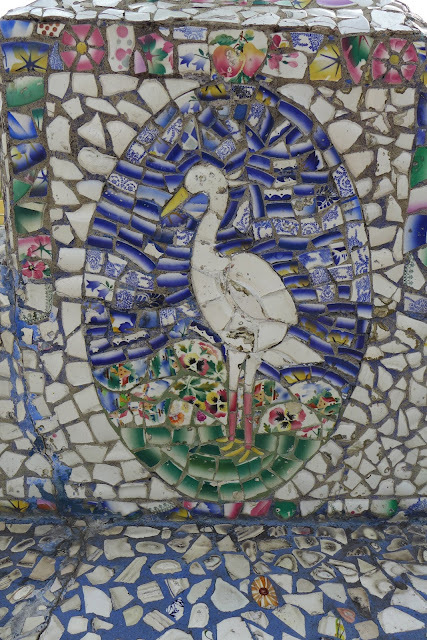 On the ends are wonderful portraits of a pair of white cranes and on the other a colorful parrot. At the corners of the park are black and white silhouettes of colonial life. 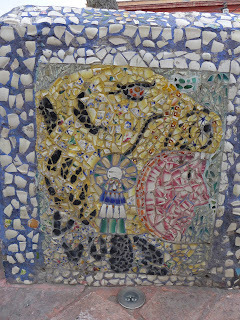 There are two panels in the park at an entrance with portraits of Precolombian ceremonial headdresses, one with a jaguar and one with an eagle. Other panels depict potted flowering plants alluding to a garden. 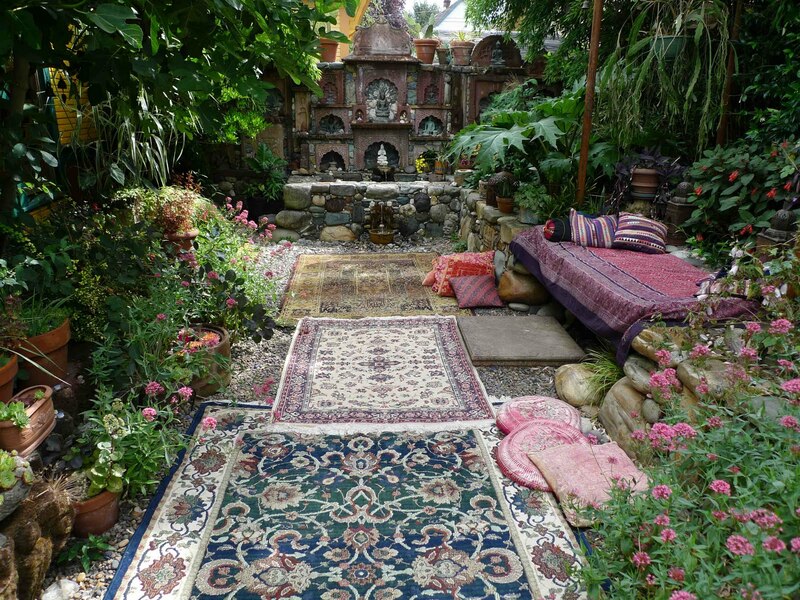 I'm so happy to have stumbled upon this wonderful little public space, which required a great deal of ambition to collect all of the materials and break them apart and reassemble them in to a magical garden of life and color. Many hundreds of plates must have been broken up. I know first hand how much work it was to manifest such a creation although I have never done a project on this scale. What a delightful find! And you did such a lovely job of capturing it. 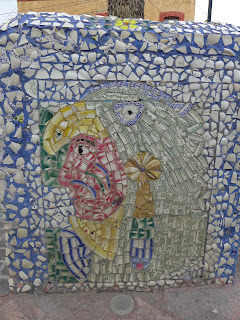 I'm going to share on the Mosaic Art NOW FB Page. Thank you, Jeffrey. Sharing with Piece by Piece in Los Angeles as many of our participants have come from Mexico and will enjoy this plaza immensely. Thank you for sharing this! Beautiful ~ and inspirational! 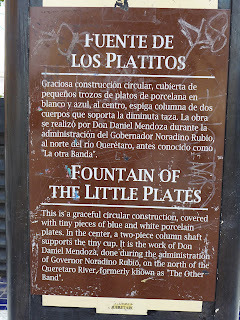 I would love to see Los platitos de la Fuente in person! Thank you Jeffrey Bale for blogging about your work and your inspirations! Thank you for sharing this little treasure. I'm impressed by this work, as I am by your work with rocks. May I suggest that the animal you thought might be a lamb looks like a cat to me.